A fragments of the Feb. 15, 2013, Russian meteorite will hit the auction block this month. When a meteor exploded over Chelyabinsk, Russia on Feb. 15, 2013, many of world's most avid meteorite collectors were gathered on the other side of the world, in Arizona, at the Tucson Gem and Mineral Show. "A lot of the meteorite guys were scrambling to leave the show early to go to Russia," said Craig Kissick of Heritage Auctions. Chunks of the meteorite that lay scattered in the snow in central Russia made it to the commercial market just months after the blast. A few fragments were even incorporated into some gold medals given out at the 2014 Olympic Games in Sochi, Russia. 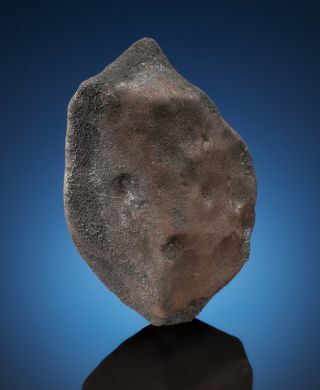 This month, Heritage Auctions is selling three pieces of the Chelyabinsk space rock as part of its latest natural history sale. The meteor blast produced a shockwave that shattered windows and injured more than 1,000 people in Chelyabinsk region. Scientists who have analyzed samples of the Chelyabinsk meteorite have said it appears to be an ordinary chondrite, the most common type of meteorite found on Earth. "I wouldn't consider it that attractive," Kissick said, but the fragments have stirred up interest among collectors because they are tied to the biggest meteorite blast in more than a century, and perhaps the most witnessed one on record. Opening bids for the three Chelyabinsk meteorite fragments start at $500, $2,500 and $4,000. The sale will take place on Sept. 28 at Heritage Auction's Nature and Science Signature Auction in Dallas, Texas.